Ah yes, the USC Trojans. Dominance in virtually every aspect, on and off the field. From song girls/cheerleaders, Pete Carroll, Matt Leinart, Reggie Bush, Carson Palmer, Keyshawn Johnson, Junior Seau, Marcus Allen, Charles White and OJ, the list just goes on, and on, and on. LAST YEAR: 12-1, 8-1 in the PAC-10, conference champions and Rose Bowl champions (yawn). USC stubbed their toes just once last year, at Oregon State in that memorable Thursday night game in week three, where the world was introduced to Jacquizz Rodgers on ESPN. But as usual, USC got their house in order and rolled through the rest of the schedule, hot knife through butter style. The season culminated in a 38-24 Rose Bowl title. 38-24 doesn’t sound like that much of a whoopin’, but the final score is misleading. SC was up 31-7 at the half, 38-14 in the 4th quarter before Penn State would add a couple of TD’s late. Interesting sidenote on USC and the Big 10. With their latest Rose Bowl victory, SC has now won their last nine in a row vs. the Big 10. And it hasn’t even been close. USC has won by an average of 36.8 to 13.1. And all nine games were won by double-digits! Last year not only included the win over #8 Penn State, but don’t forget SC blew out #5 Ohio State 35-3 earlier in the season. Very, very impressive. LAST YEAR vs. WSU: Uh, yeah. 69-0. ‘Nuff said. FANS ARE: You mean aside from starting to sweat the Ruggie Bush/OJ Mayo sandwich investigation? They are pretty cool with everything. Disappointed they didn’t get a shot at the BCS title, but hey, understanding as to why they missed out last year. You lose one game, and you are in that mix of teams who more or less have to “politic” their way into the conversation with the rest of the one-loss teams. 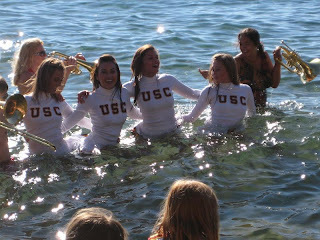 USC would finish a strong #5 in the BCS standings, #5 in the AP poll, and #4 in the coaches poll. I guess they could be a little bored as well. Bored, if you consider going to the Rose Bowl four years in a row and five of their last six seasons have ended in Pasadena? Of course, this year, the Rose Bowl will be just fine, thanks….it’s the site of the BCS title game. So Pasadena will just have to do this year! 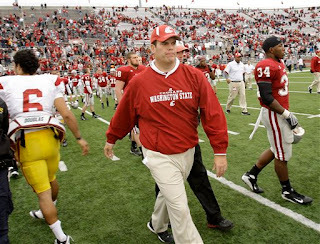 OFFENSIVE SYSTEM: Even with the departure of Steve Sarkisian to UW, the offense should be largely what you are used to with SC. Jeremy Bates was hired from the Denver Broncos to be the new play-caller on offense, while John Morton will help coordinate the offense. And so far, so good, according to reports of the new coaches. Not exactly missing Sarkisian? But don’t look for any drastic changes. A pro-style offense with a fullback and tight end, but not afraid to go three-wide and use motion when necessary. #14 in the nation in scoring offense at 37.5 points per game. #22 in the nation in rushing offense at 194.8 yards per game. #22 in the nation in passing offense at 259.8 yards per game. A nice and balanced attack, averaging 454.7 yards per game in total offense. ’09 RETURNING OFFENSIVE STARTERS: NINE (wow!). TOP OFFENSIVE PLAYER: While Joe McKnight gets the accolades, and Youtube fame as well. But McKnight is really just one of a cast of thousands in the USC backfield (OK, not thousands, but more like five other guys will carry the ball along with McKnight). It’s hard to ignore McKnight’s 7.4 yards per carry last year, but he only had 89 carries on the season. 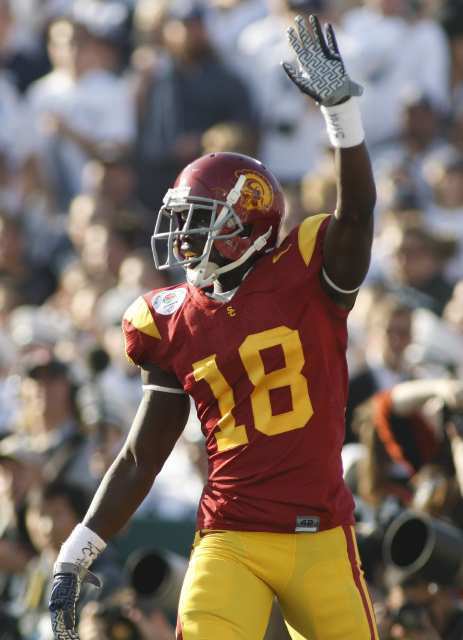 While he should have a big ’09 season, I’m going to go in another direction and pick rising WR Damian Williams as the top offensive player for USC. Williams was a transfer from Arkansas, who fled to LA along with QB Mitch Mustain in a much-publicized move across the country. Mustain was the headline guy in all that, but it turns out that Williams has already made a far greater impact on the football program. In his first season at SC, Williams led the team in catches (58), yards (869) and was second in TD’s (9), all as a sophomore. Williams isn’t huge in the Dwayne Jarrett/Mike Williams mold, standing 6-1 and weighing 190, but he has the look of a special WR. Williams had a huge Rose Bowl, with 10 catches for 162 yards and a TD. Watching the video, you see how explosive he is. There are several plays where he doesn’t quite look like he has the angle, then boom, he’s by the guy (check the TD vs. UCLA as an example). Williams is arguably the top WR returning in the PAC-10 for ’09, and should be on several first-team all-conference lists. And his return should help the new young QB, whether it’s Aaron Corp, Matt Barkley or someone else. DEFENSIVE SCHEME: Your NFL-style 4-3 attack, with big meaty NFL-type tackles and great speed on the edges. They don’t go crazy with blitzing either, instead relying on their front four a lot of times to create the pressure they need. They will blitz, but you don’t see huge sack totals from their linebackers. But they are physical as hell and always tackle as well as any defense you will see in the conference. Top in the PAC-10 in scoring (9.0 ppg), total defense (221.8 yards per game), rushing defense (87.4 yards per game), pass defense (134.4 yards per game), and pretty much everything else. If you want to nit-pick, they were only number two in the conference in interceptions, and were fifth in sacks. But overall, a fantastic PAC-10 defense. TOP DEFENSIVE PLAYER: This one is easy. Taylor Mays couldn’t be any bigger, a 6-4, 225-lb free safety NIGHTMARE in the secondary. Mays surprised a lot of people when he opted to return for his senior year, when many NFL mock drafts had him pegged as a sure-fire first round pick. And what is amazing about Mays is the way he can play at his size at free safety. 6-4, 225? That’s at least an outside linebacker on a lot of teams, and maybe even a defensive end. Instead he’s back there hitting the crap out of opposing WR’s. He’s in the conversation as top defensive player in the conference, and one of the best in the country. One interesting aspect is the debate between Mays and Eric Berry, the all-everything safety from Tennessee. Of course the SEC angle is that Berry is better, and it’s hard to argue the numbers (Berry had more tackles, sacks, interceptions, etc compared to Mays last year). Not that it matters, but still, interesting to see the debate. Mays may not be a big-time stat hound, but there’s an awful lot he does that doesn’t show up on the stat sheet. And besides, who wants their free safety to be a top tackler on your team? Mays had NFL talent everywhere on a defense that saw five first-day draft picks this spring, so it was unrealistic to expect him to be this stat-stuffing monster. But with just three returning starters on D, there is no doubt who the best defensive player is coming back in ’09. 1) Start at the top. How’s the QB battle look? From all accounts, Aaron Corp is the man. Corp played very little last year, attempting just four passes in ’08 as Marc Sanchez had a great year at QB. But can Corp really replace the top NFL draft choice/superhunk QB? Corp had a nice spring, showing everything the coaches are looking for in the spotlight position. He did everything asked of him, and then some, holding off challenges from Matt Barkley and Mitch Mustain to take control of the helm…..at least RIGHT NOW. Per the LA Times, “right now” is a key phrase. Bates’ word choice — “right now” — was intentional. And Coach Pete Carroll could not seem to repeat often enough that the competition to replace Mark Sanchez would continue. “By no means is this thing over,” Carroll said. It should be one interesting fall camp to settle the position, but right now, Corp is the man who shall lead them. 2) Just THREE starters back on D? No Maualuga, Cushing, etc? Whatever are they to do!? Eh, don’t sweat it. SC’s defense will be just fine, just as it always is under Pete Carroll’s watchful eye. Yes, some big names at linebacker are gone to the next level in Rey Maualuga, Brian Cushing and defensive end/hybrid Clay Matthews. But the word on the street is that the young talent set to replace them could actually be faster than the likes of Maualuga and Cushing. SC does lose their top four tacklers, as well as their top sack guys in Kyle Moore, Clay Matthews and DT Fili Moala. But Everson Griffen is back at defensive end, and it is his time to live up to the hype. Pete Carroll once called him the best defensive recruit he ever had, so no time like the present to take the next step! 3) How about that schedule? Not too shabby. Per Phil Steele, they weigh in with the 87th rated schedule in the country based on 2008 winning percentage. The first month is interesting, opening up with softball San Jose State before traveling to Columbus in week two to take on the Buckeyes in a major REVENGE game from last year’s 35-3 wipeout in LA. SC then goes to Seattle to play the “former assistants bowl” vs. Sarkisian and Holt, and then, they host the Cougs in LA to close out the month. However things do get a little dicey in October, with road games at Cal, Notre Dame and Oregon. They close out the season with three of their last four at home, and they are all games they should be heavily favored to win. So get through October, and they could be home free to another PAC-10 title. WSU FOOTBALL BLOG SEZ: It has been an unbelievable run for USC. You are talking about a program that has, for SEVEN straight years, had at least 11 wins, been in a BCS bowl, had at least an AP top 4 finish, and of course, won the PAC-10. No team in the history of the conference has enjoyed such a dominant run. But is THIS the year they take a step back? There is so much lost from their defense of last year, one of the most talented USC defenses in school history, likely one of the most talented in PAC-10 history. Talent is one thing, game experience is another, and so you have to wonder if there might be some youthful mistakes early on? Then again, it’s USC we’re talking about. Always at the top in the recruiting wars, they’ve been in these kinds of positions before. Heck, there was talk last year that USC might take a step back with a brand new QB in Sanchez taking over for John David Booty. 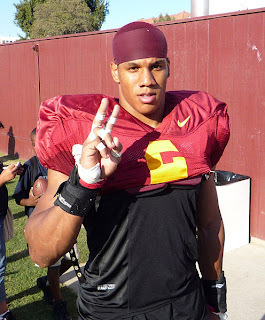 And in fact, last year USC had just 11 starters coming back on the entire team, including just four on offense. But we know how that worked out, yet another PAC-10 title, Rose Bowl win, blah blah blah. So in reality, people might pick against USC this year based on what they lost, but they actually have MORE starters back in ’09 compared to a wonderful ’08! We’ll have our official picks later this summer, but based on recent history, don’t just automatically assume they will come back to the pack. That’s it for a Trojan Thursday. Enjoy it, and as always, GO COUGS! You are currently browsing the archives for the Damian Williams category.